You may have noticed that I really only wear my hair two ways: straight or curled. Lately, I've been experimenting with different styling methods within these two categories and thought I'd share how I achieve a "beachy wave" look on my naturally pin straight and very fine hair. 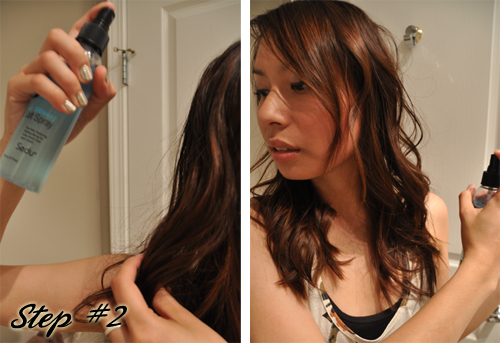 Since heat styling is an integral part of this tutorial, start by spritzing your hair with a heat protectant. 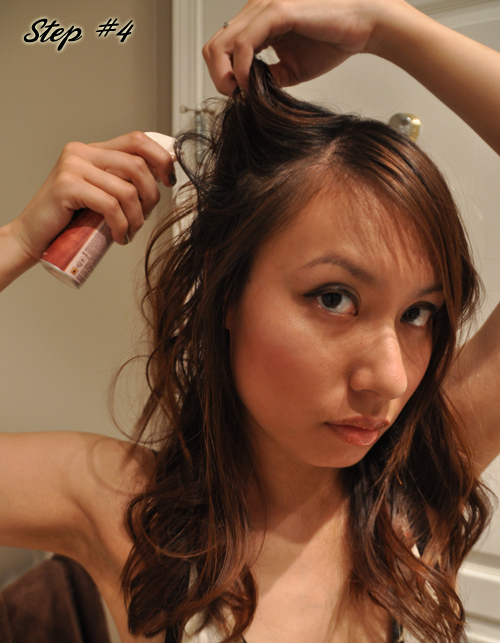 I'm currently using the Got 2B Guardian Angel Heat Protect 'N Curl Spray and Gloss Finish. My thoughts are largely the same with respect to the Got 2B Guardian Angel 475°F Heat Protect 'n Blow Out, which I've reviewed before, so read this if you want to know what I think about it. Next, curl your hair as normal. I recommend using at least a 1.5" curling iron for looser waves. To achieve the "beachy" look, you'll want to use a beach/salt spray of some kind. Here I'm using the Sedu Beach Beauty Sea Salt Spray which smells just like coconut, one of my favourite scents! To use, you simply shake the product up to mix it and spray all over. I had initially hoped to use this spray as a way of creating texture when I wear my hair natural but unfortunately it does absolutely nothing except leave it feeling a little more "piece-y" than normal. 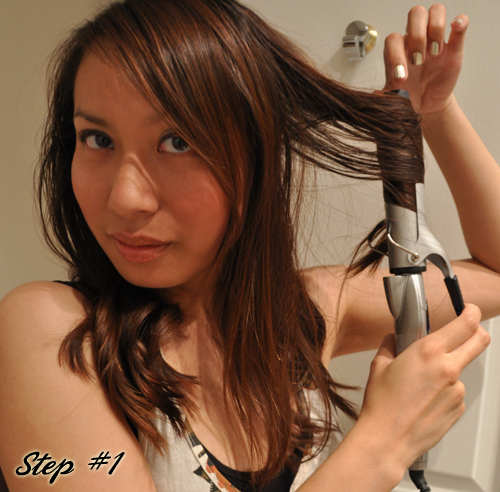 I would not recommend it if you have hair like mine (long, fine, straight) unless you are going to curl it like I've done in this tutorial. This product does have great reviews, however, so if you have a natural wave to your hair you may have more success without having to resort to a curling iron. 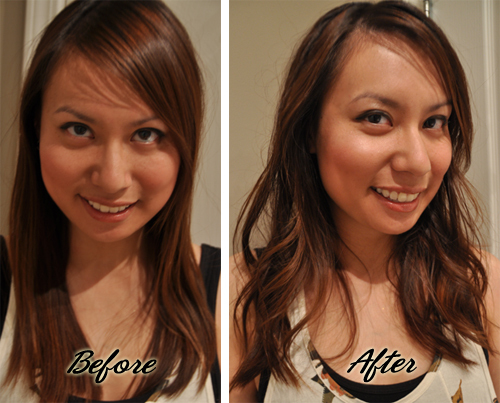 Once your hair has sufficiently been coated with the beach/salt spray, scrunch to create texture and loosen your curls. To get some extra volume at your crown, spray your roots with a volumizing spray like Alterna Bamboo Uplifting Root Blast. Unlike a dry shampoo, this is a root boosting hair spray made with organic bamboo and maca root. It works best on dry hair and I have been quite pleased with the results. The only thing I'm not particularly fond of is the scent, which smells like stale men's cologne, but thankfully it wears off quickly/I stop noticing it. Lastly, hair spray to set all your hard work. I'm a really big fan of Tresemmé Tres Two Extra Hold Hair Spray, which can be found at any drugstore and usually for very cheap. I've found it does an especially good job keeping the frizzies at bay and my curls usually last the whole day unless I get caught in the rain. And that's it! The whole process only takes me about 10-15 minutes to complete (curling takes the longest) and I'm left with a great casual hairstyle that's perfect for the summer! Disclaimer: I received the Sedu Beach Beauty Sea Salt Spray and Alterna Bamboo Root Volumizing Spray for review from Folica. All other products used were purchased by me. The hot new website Klury.com offers a unique upscale online shopping experience where fashion lovers can exchange and replenish their designer wardrobes. Sell your pre-owned luxury items to Klury, or find some new-to-you ones at great discounted prices... it's all easy to do on their user-friendly website. This week, I'm thrilled to be the featured Klury.com Curator. I've selected a number of pieces inspired by a Summer Cocktail Hour and hope you'll have a look! 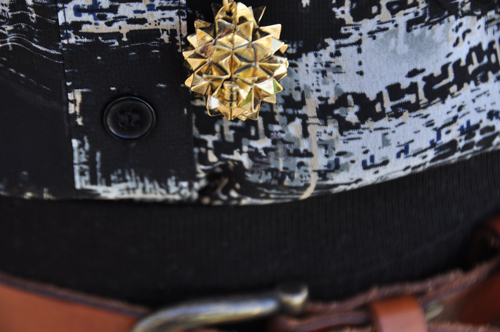 Check out my feature on the Klury Blog HERE and shop my picks HERE. Ever since Minx Nails became popular, I've been wanting to try out the whole nail polish sticker/wrap thing. And I finally got around to doing so thanks to Elegant Touch, the UK's #1 false nail brand which has now made its way to North America. In addition to offering really fun nail trends at affordable prices, the brand recently teamed up with celebrity nail technician, Kimmie Kyees, on a collection of celebrity-inspired false nails. I've gotten so many compliments on my nails and I seriously can't stop staring at them - they're so fun! Since this was my first time using nail wraps I was a little worried about how the application would turn out, but it really is quite simple. First, you apply a base coat and let it dry. Then you pick whichever size stickers match your nails and stick them on firmly. The instructions say to file down the edges, but I found it easier to first cut off most of the overhanging sticker so that there was less to file. Once that was all done, I used a blowdryer on each nail for about ten seconds since the heat is supposed to help with adhesion before setting it all with a top coat. Because the nail wraps are texturized, filing the edges of my nails was a bit tricky and I wasn't able to get them completely even. Probably due to this shoddy filing job, my nails started to show tip wear by day 3 but it wasn't actually that noticeable unless you looked super close due to the glistening effect of the wraps. I also liked that there was no drying time (other than the clear top coat) so your mani is good to go almost immediately! However, application is still time-consuming with all the trimming and filing. In addition to the Envy Wraps Bling line, Elegant Touch also has a regular Envy Wraps line. The Envy Wraps Bling feature unique 3D designs like the ones I've posted here (I also really like these ones), while the Envy Wraps come in mirrored animal prints. Interested UK readers should be able to find these products fairly easily, and US readers can now find Elegant Touch at Ulta stores and Ulta.com. Hopefully they will come to Canada next, as I think they're a more unique alternative to the Sally Hansen Salon Effects Nail Polish Strips. 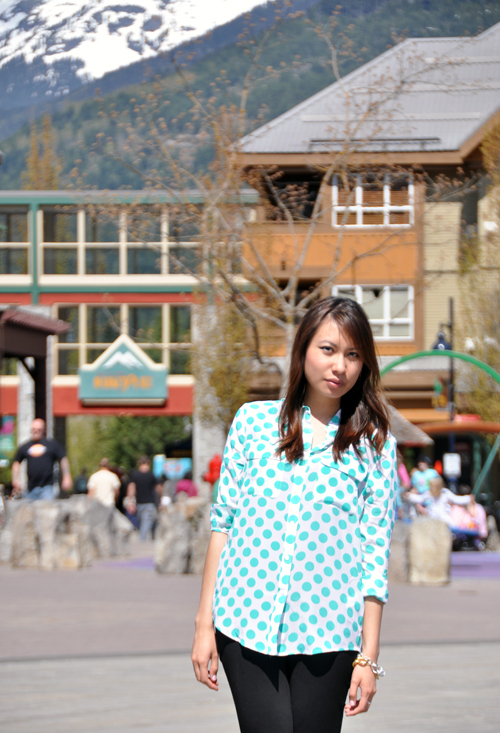 It was my boyfriend's birthday this past weekend, so we headed up to Whistler for a mini getaway. 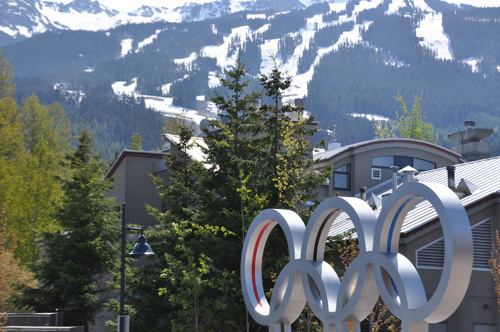 I haven't been up since before the Winter Olympics in 2010 so it was interesting to see how the Village has changed... all sorts of Olympic paraphernalia to remind us of the Games. 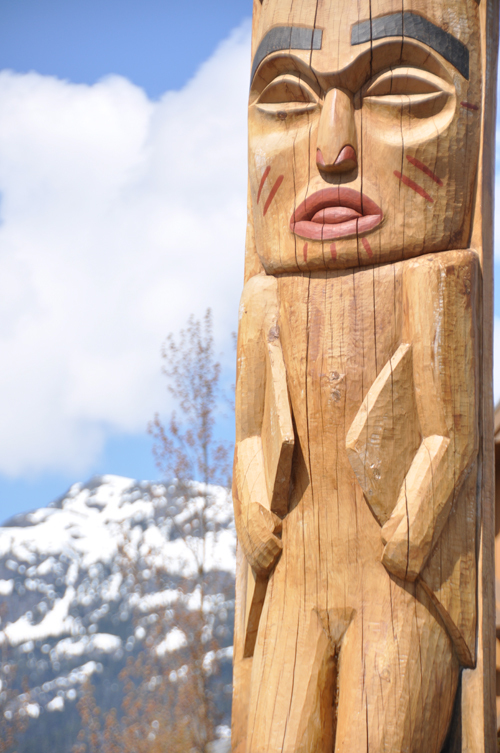 There is still snow on the mountains and a couple of runs remain open for skiing/snowboarding. However, down at the base, the weather was quite nice so we decided to go on a "hike" around Lost Lake (the more athletically inclined among us would probably call it a "walk"). Now I'm back in the city and ready to hit the books - my Bar Exams are in 10 weeks! With the summer weather hitting our sun-deprived city, I've found myself increasingly drawn to lighter and brighter colour palettes. Admittedly, white pants still cause me much concern due to their "easily visible spills" potential (in fact, the last time I wore these was in my blatant rip-off of Zara's lookbook), yet I do love how crisp they can make an outfit look. Now if only I could figure out some way to not get them dirty! Thank you so much for all your nice comments on my last post. Though I still feel like I'm on an emotional roller coaster with no end in sight, I am incredibly grateful to have so many wonderful people in my life, as well as this blog (and you lovely readers), to keep me distracted. With that being said, it couldn't be more appropriate that Mother's Day is this Sunday... Now, more than ever, I am aware of how truly important it is to treasure our loved ones and make sure they know it. My family situation has been particularly difficult for my mom, so I am wishing her all the strength in the world, and sending my love to her everyday. 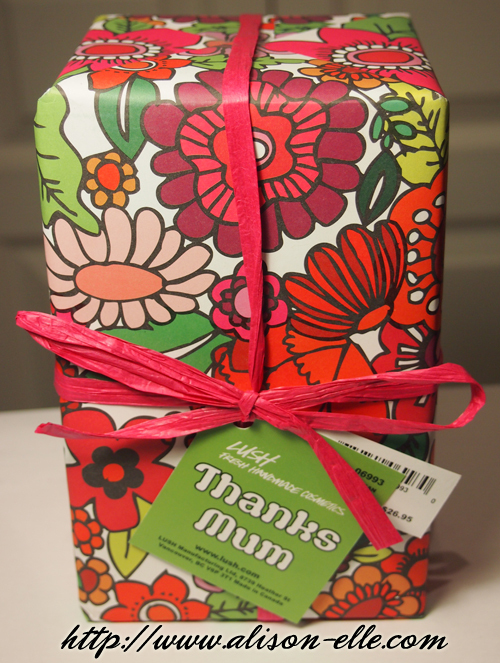 And for those of you still on the hunt for the perfect gift for the mothers in your lives, may I suggest some fool-proof pampering & spa treats, such as this limited edition LUSH Cosmetics Thanks Mum Gift Set ($26.95 CAD), which I was recently given the chance to preview? I'm a hand cream fiend (see my review of Cake Beauty's Velveteen Hand Creme, for example) but have never tried a solid moisturizer like this before. It's a little weird, but I really like it! Scented with vanilla and marigold, all you have to do is rub the bar over your hands to soothe and moisturize. I find it a bit greasy so would personally only use it before bed and not throughout the day. Similar to the Easter-edition Carrot Top Reusable Bubble Bar that I posted about here, you simply swirl this wand around in your bath to create mounds of frothy bubbles and then leave it to dry to be re-used up to five more times. Madame Butterfly smells just like roses and can be bundled with LUSH's other Mother's Day re-usable bubble bars, The Mum and Mum Tulip, to make a cute bath "bouquet." A great exfoliating product made with Fair Trade sugar that stimulates circulation through the inclusion of fennel and ginger. I don't typically use body exfoliators (other than exfoliating beads in my body wash) so this was a new experience for me. Smells great but might be a bit harsh for super sensitive skin. I would also recommend storing it away from water in a tin or travel soap dish after use so that it doesn't melt away. 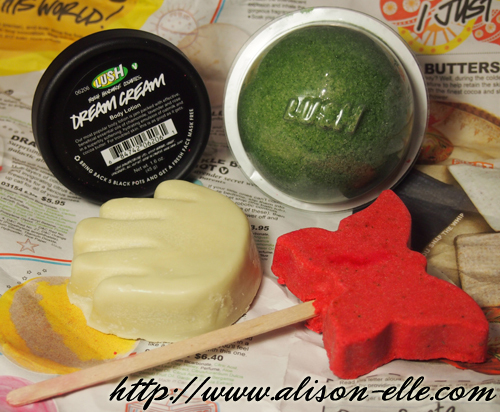 I posted about Dream Cream in my review of the LUSH Home for Christmas Gift Set and my thoughts remain the same. Since it's no longer winter, however, Dream Cream is now perfect for daily use (in my opinion). If you're looking for other Mother's Day gift ideas, be sure to check out LUSH's other Mother's Day products and gift sets. As always, they're limited edition! Sometimes life can be so incredibly cruel and unfortunately for me and my family, one of the worst things that could have possibly happened to us has, in fact, recently happened (sorry to be vague, but it really pains me to talk about it). As I am currently dealing with what seems like an almost insurmountable grief, I wanted to let you all know that my updates may be more sporadic than usual.